Also referred to as a “tear-off”, a Replacement System starts by removing all of the existing roofing materials to the top surface of the structural roof deck. Although there is certainly a cost associated with a “tear-off”, this roof system provides you the longest projected service life. You have the advantages of being able to inspect and make any repairs needed to the structural roof deck and avoid any possible negative impact upon the new materials that may be associated with leaving a deteriorating existing roof deck in place. There are two (or more) roofs on the building. The existing roofing system has moisture trapped within the assembly covering 30% or more of total roof area. 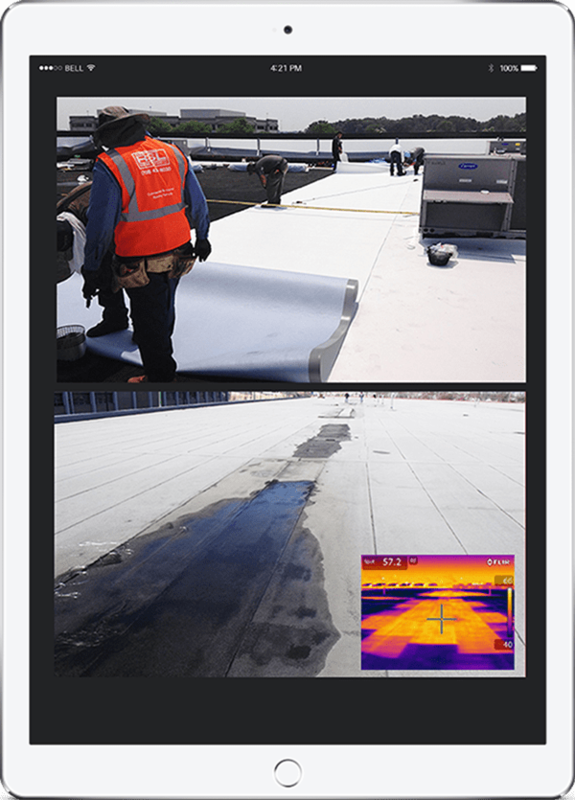 To obtain this information, we can perform an Infrared Scan to locate and quantify exactly where the moisture is located within the roofing system and how much of the roof area is compromised so that an informed decision can be made. The existing roof does not present a viable substrate for the application of a second roof. The structural roof deck shows signs of decay or cannot support an additional system. The State of Illinois has adopted the 2015 International Energy Conservation Code (IECC) which mandates that all new commercial / industrial roof systems include new insulation with a minimum "R-value" of thirty (30). This applies to any roof replacement project but does not apply to recovery systems - the trigger is removing the existing roof and exposing the roof deck or underlying substrate insulation. By law, this is now a permit requirement of every Village in Illinois. A Recovery System is one where a second roof is installed on top of an existing one and can be an excellent cost-saving alternative to a full replacement. There are a few key criterion that need to be addressed in the design of a successful long-term recovery system. The existing roofing system has been maintained properly and is still within its manufacturer defined expected service life. Roof leaks have been minor or have been in isolated areas. The structural roof deck can accommodate the additional dead-load weight. 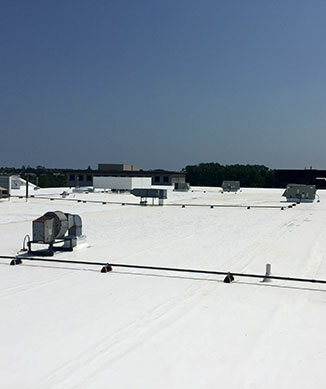 The structural roof deck will provide an acceptable “pull-out” rating for retrofit fasteners or adhesives per your zone’s recommended wind uplift requirements (FM I-90 for Chicago and surrounding areas). There are already two (or more) roofs on the building. The existing roofing system has moisture trapped within the assembly covering 30% or more of total roof area. The first step in a roof retrofit is the manufacturer-required moisture scan. We will perform a full thermographic moisture study of the existing roof, locating any areas in need of replacement prior to the application of the new roofing system. Any “wet” areas located and confirmed by follow-up testing will be cut-out and removed to the structural roof deck and then backfilled with new insulation to the height of the existing roofing system before the new system is installed. If you have a flat roof, you will ultimately choose from the four major product groups: Conventional Built-Up, Modified Bitumen Built-Up, Thermoplastic Single-Ply (TPO/PVC), and Thermoset Single-Ply (EPDM). Metal building owners have the option of Elastomeric Liquid Systems as well. You will probably want to do some research on each of the groups, depending upon the specifics of your structure and your plans for use of the roof area. For example, if you have a metal roof deck, you are probably going to want a lightweight system. Or if you have a substantial presence of equipment mounted above and through the roof, you may prefer a multi-layer system for its thickness and puncture resistance. Find out about our roofing systems. We would be more than happy to supply you with information that comes from the industry’s most respected sources, as well as the major manufacturers, to help you make an informed system selection. Our proposals include photographs that show you the various steps associated with installing the systems listed above, cross-section sketches to illustrate the components that make up each system, and narrated video documentation when applicable so that building owners and decision makers can have a clear understanding in the needs of their roof without ever stepping foot on a ladder.